It’s time that Class 8 commercial trucks deployed high-tech cameras instead of the assortment of mirrors — rearview, down view and blind spot — found on today’s tractors. A camera monitor system gives drivers a larger field of vision, provides a clearer image of surrounding traffic, offers improved views at night and automatically moves the image when backing to show the rear of the trailer. In addition, a camera monitor system eliminates blurry or frozen views due to rain or snow. 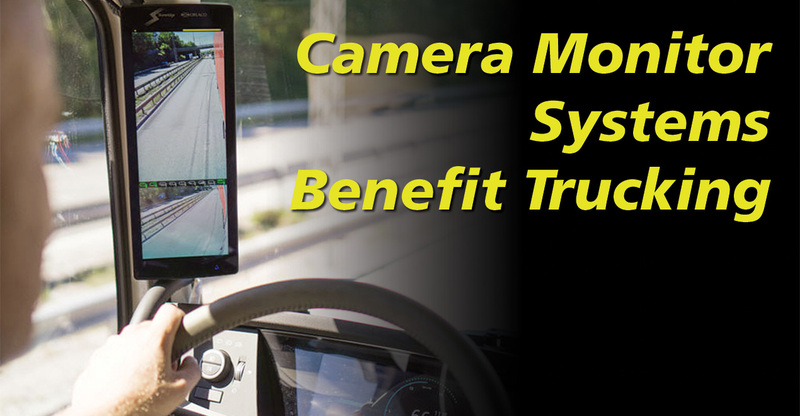 Given those real benefits reported by drivers testing the system, I’m hopeful that federal regulators will allow commercial truckers to adopt camera monitor system technology in place of all the mirrors currently hung on doors and hoods. Stoneridge, maker of the Mirror­Eye camera monitor system, petitioned the Federal Motor Carrier Safety Administration to allow trucking companies to remove the rearview mirrors on driver and passenger doors while operating its camera monitor system. The request for exemption came nearly one month before a new federal mandate for camera systems on new cars and trucks under 10,000 GVWR manufactured after May 1, 2018. Camera monitoring systems were not specifically mandated in the effort to reduce injuries and deaths from vehicles backing up. It was the only system able to meet the regulatory requirements. Cars and light trucks must have camera monitoring systems in addition to exterior rearview mirrors. According to Steve Fox, vice president of business development for the Novi, Mich.-based Stoneridge, the company’s system consists of several cameras mounted on the cab above each door as well as monitors mounted on the interior of the two A-­pillars. The cameras monitor side rear views and blind spot areas alongside the tractor. A-pillars are the cab structure between the edges of the windshield and the cab door openings. The public comment period ended May 7, and as of press time, Stoneridge expects a decision from FMCSA later this year. Among the supporters of the exemption, American Trucking ­Associations and several fleets noted that testing a camera monitor system without mirrors would paint a true picture of pros and cons and allow NHTSA to gain more insights needed to further develop standards for the system. Bosch and Continental Automotive offer camera monitoring systems suitable for Class 8 trucks in North America. They did not petition FMCSA. Stoneridge has ongoing tests with three fleets where the camera monitor system-equipped tractors have amassed nearly 1 million miles. Tractors equipped with the system still have mirrors. J.B. Hunt Transport Services Inc.’s Greer Woodruff, senior vice president of safety, security and driver personnel, noted in comments to FMCSA that drivers had overwhelmingly positive feedback. Comparing a camera monitoring system to traditional mirrors, he said company drivers reported their field of vision was greater and the “problematic front passenger side blind spot” was eliminated. Other improvements or benefits drivers experienced included improved visibility for drivers at night and a reduction of glare during daylight hours, according to comments supporting camera monitor systems from truckload carrier Schneider. Thomas C. DiSalvi, the Green Bay, Wis.-based company’s vice president of safety and security, raised the point that operating tractors with only CMS could provide a 2% to 3% improvement in fuel economy. But that theory can’t be validated until FMCSA allows trucks to operate without exterior rear-view mirrors. “We want to be clear that the technology can be used today, we just can’t remove the mirrors,” Stoneridge’s Fox said. Detractors of camera monitor systems in comments to FMCSA questioned reliability and how fleets would deal with a failure. Fox explained the system is designed with redundant elements. “Multiple cameras are used,” Fox said. “All video processing is done using independent channels and presented in five views.” Based on their design and location on the vehicle, the cameras are less likely to suffer impacts than mirrors, Fox added. “Fleet testing shows excellent reliability,” he said. Phil Romba has covered trucks and maintenance as a full-time journalist and worked as a public relations manager for Volvo Trucks North America during his 20-year-plus career.